In what was to become the Recreation Ground, the "cutting of first sod" ceremony for Roath Park was performed by the Marchioness of Bute on the 24th August 1887. The Recreation Ground has an area some 23 acres. It was formed by diverting Roath Brook (Nant-y-dderwendeg) from its original course, from the middle of the site to the eastern side, to enable a flat grassed area to be created, suitable for organised sports. This work was carried out by the contractors Logan and Hemingway and was completed by 1891. Subsequently the land was levelled, in some places having to be made up by as much as three feet. In April 1893 the Parks Committee requested the Health Department to tip all available refuse at Roath Park to fill up the old brook course. By the end of 1890 iron fencing had been erected all around the Recreation Ground. Eventually there were a number of gates: two at the south end opening on to Penylan Road, two on the northern side opening on to Alder Road and at least one on the western side opening on to Ninian Road. When an inspection of the Park was carried out on 23rd February 1894 by the Mayor and Committee members, the sports facilities included a gravel cycle track similar to that at Sophia Gardens but double the circumference, being almost a mile in length. Initially the Recreation Ground was divided to provide space reserved for girls and young children separate from that to be used by men and boys. In 1895 a line of trees including elms was planted along the outer edge of the recreation ground, "which in a few years time will form a magnificant avenue". Also in its early days the Recreation Ground could not be closed at night, owing to the terms of the Cardiff Corporation Act 1884 empowering the Council to establish recreational spaces, and park keepers would patrol at night with bulls-eye lanterns. In October 1900 the process was started to allow closure of the Recreation Ground at night, but as this required Parliamentary approval it did not take effect until July 1904. Although there were several football pitches where local clubs would play, there were no changing rooms for teams and no goalposts provided. The Recreation Ground became more organised in 1904 when the Council decided to select and set apart suitable spaces for cricket, football and bowls. It was also agreed to provide a movable shelter to act as a changing room. In April 1905 the Superintendent reported that five cricket pitches for matches and 3 practice pitches had been laid out. In 1908 Parks Superintendent brought forward a scheme to make it possible to flood part of the Recreation Ground temporarily in a severe frost, to create an area for safe skating. This was in response to disappointment expressed by members of the public that Roath Park Lake seldom froze over with sufficient thickness of ice to permit skating. Although the Parks Committee instructed the Superintendent to investigate the idea and provide costs, in the event no action was taken. In 1913 a plan estimated to cost £1000 was approved for pitching the bottom portion of the sides of the brook in the Recreation Ground, so that children could paddle there, as is shown in postcard images. An old set of concrete steps can be seen descending into the water in this area (see the photograph below taken in March 2013). Concrete edging is visible on both sides of the brook, indicating that it used to be much wider than it is now. Like many other parks and open spaces, the Recreation Ground was used for allotments during the 1914-18 war and this continued after the war until 1920, when the Parks Committee served notices on the allotment holders to terminate their tenancies. During the 1920s the level of the Recreation Ground was raised by tipping "scavenging refuse". This process was started in 1923, not without opposition from local residents,and was completed in 1929. A.A. Pettigrew reported that in 1930 the surface was still unsatisfactory for the playing of games. When the sports field was eventually restored, rugby and soccer pitchces were provided in winter, while in summer baseball was the dominant game. Ordnance Survey maps show that the playing area was enlarged between 1919 and 1940, by the removal of the footpath running along the south west side of Roath Brook. Later maps show that this footpath was restored in the 1950s and now runs between the brook and the playing field. In June 1896 the Parks Committee agreed to place two drinking fountains in the Recreation Ground. 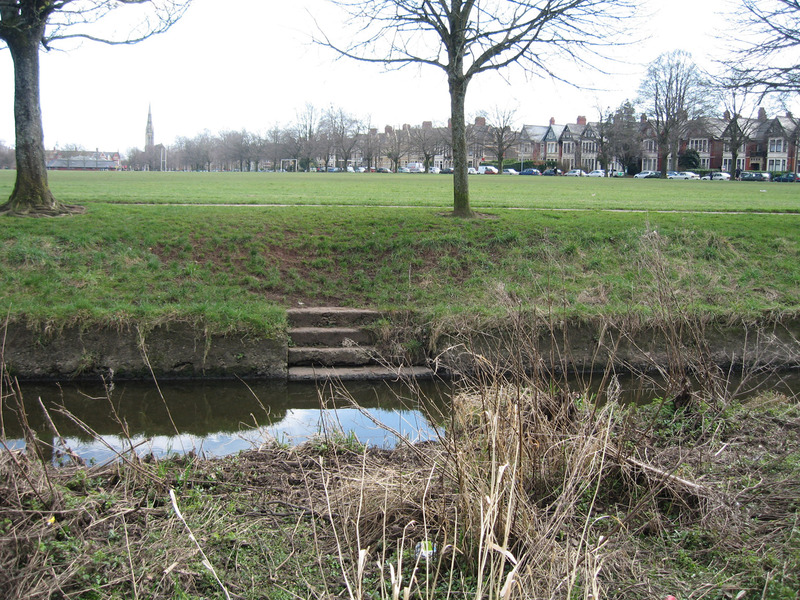 Two fountains were shown in the Recreation Ground on Ordnance Survey maps for the 1900s through to the 1920s. One was at the northerly end near Alder Road and was marked as a "drinking fountain" whilst the other was at the southerly end near Penylan Road and was marked as "fountain". This was the site of a drinking fountain presented to the Council in 1913 by the Samuel family. It was formally accepted by the Lord Mayor at a ceremony in the Recreation Ground on September 29th 1913. By the 1940s both fountains had been removed, possibly contributed to the war effort after the Parks Committee decided in March 1943 that it would not object to the removal of canopies from fountains in the parks for that purpose. Later a drinking fountain was placed in the Pleasure Garden, near the tennis courts and bowling greens. The Recreation Ground saw a number of changes during the 1939-45 war. In September 1939 it was in use as a barrage balloon depot, and in 1940 part of the ground was laid out as allotments. An aerial photograph taken in 1941 shows the allotments to have been at the northern end, bordering Alder Road, and they occupied roughly half the Recreation Ground. The railings were removed after the Parks Committee agreed in February 1941 that railings from several parks and open spaces be contributed to the war effort. Buildings were added at the south end for ARP (Air Raid Precautions) purposes. These included a wardens' post, decontamination, cleansing and rescue centres, and a report centre. By April 1945 the rescue centre was being used by the Parks Department as a dressing room. Another building became the Roath Park Recreation Centre after the war. It was formally opened for recreational purposes in November 1945 and was used by local societies and theatre groups. In 1955 it was decided that this building would be leased to the Libraries Committee on an annual basis, and the following year it became Roath Park Library. The formal appropriation of the site to library purposes was approved by the Parks Committee in 1970 and it was later renamed Penylan Library. 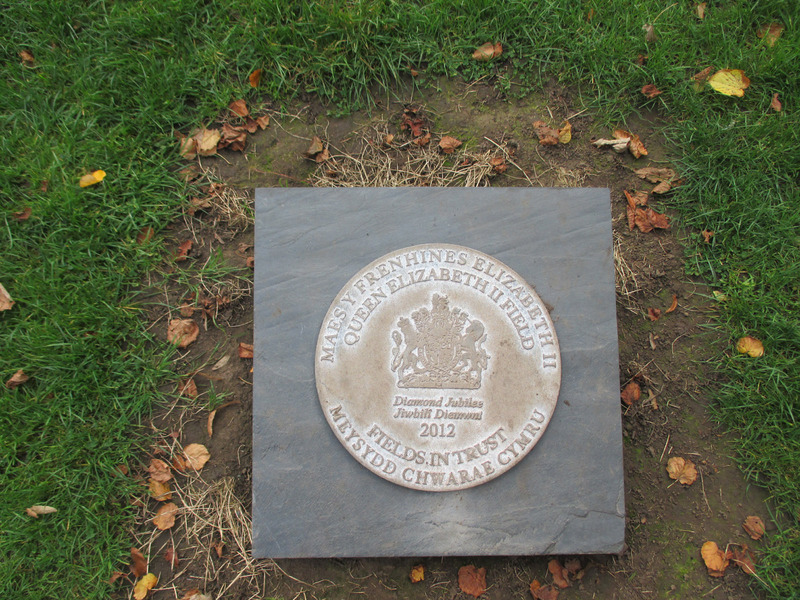 In 2012 the Recreation Ground was dedicated as a Queen Elizabeth II Field to mark the Queen's Diamond Jubilee. The purpose of Queen Elizabeth II Fields is to protect outdoor recreational spaces across the UK. In general the information in this section is taken from A. A. Pettigrew, The Public Parks and Recreation Grounds of Cardiff, Volumes 2 & 3.